We left off last time arriving in Meknes to meet up with Sabine and Red. 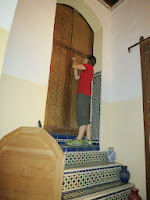 We stayed at the beautiful and lovely Riad Amazigh in the Medina. 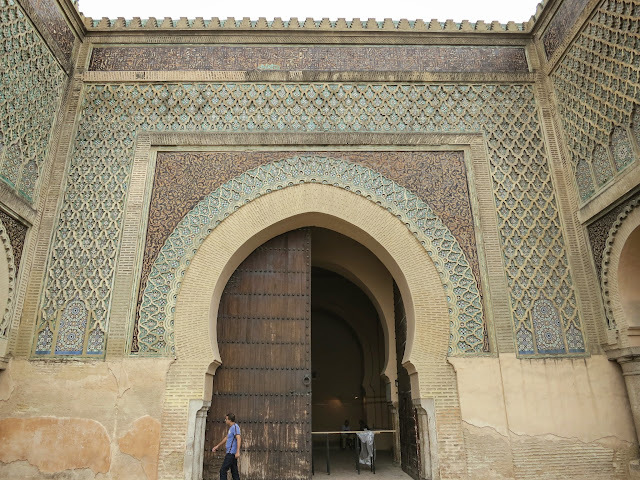 It has the most unassuming front door, and an exquisite interior! You can see here, including the giant door to our room and the balcony to the main sitting area. 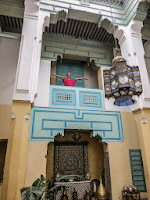 We really enjoyed Meknes. We spent the first day exploring the medina which is an endless maze of small roads. It was much less touristy than Marakesh. The market areas were all meant for and busy with locals doing their errands and bustling to and fro. 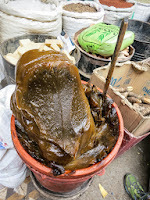 We saw many neat things like barrels of gooey black soap and sugar cones. 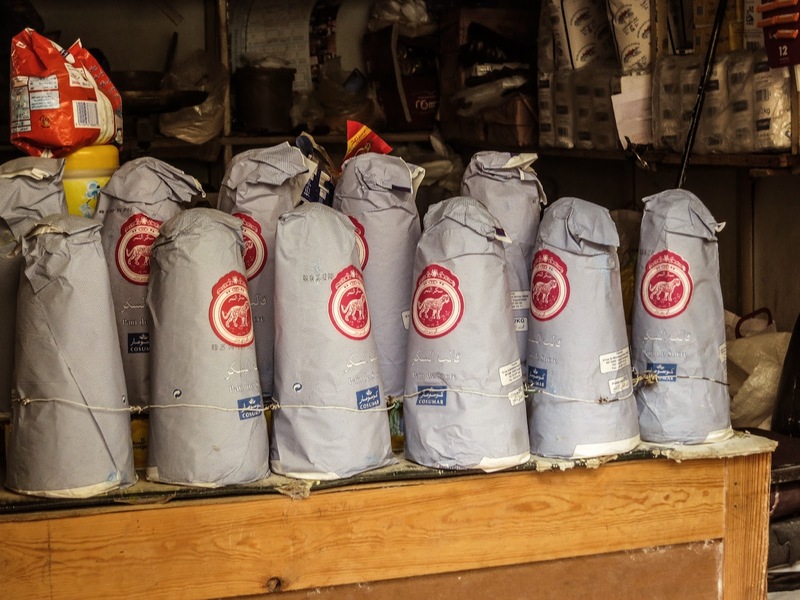 The black soap was very common and we tried it out at the riad. It has a very gooey texture. The sugar cones we'd seen in pieces in the desert broken into pieces for tea. But here we saw the full cones which Red had been telling us about. 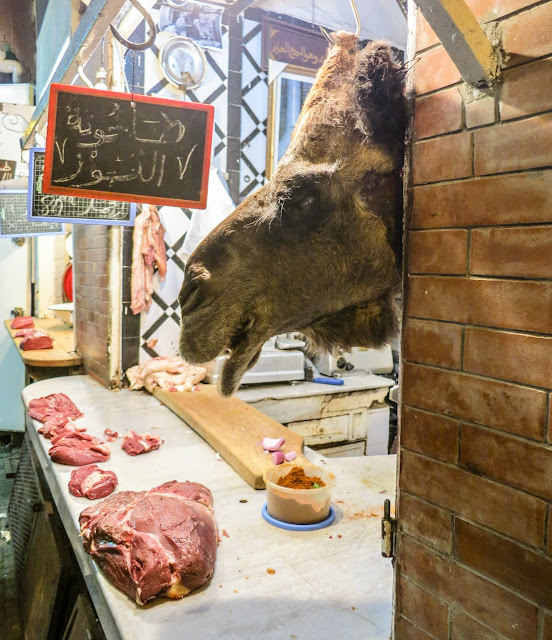 The most unusual thing we saw though was at a butcher's shop just around the corner from our Riad. The butchers in Morocco like to keep their choice cuts of meat out on the counter for you to see, despite not having refrigerated counters. We saw this everywhere we had been, and were quite used to it. This particular butcher however wanted to stand out even more from his competition. He did this by having a camel head on display at the corner of his booth. It definitely helped us from getting lost in the maze of streets when we were trying to get back at night, we just looked for the camel head and made a left! It took us until the last night to get the courage to ask him if we could have a picture. We really enjoyed the more relaxed atmosphere and the feel of the city. 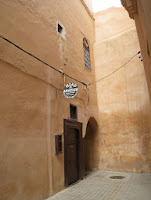 In the afternoon we hired a local guide recommended to us by the Riad to take us to some places we might not have found. He took us to the garment district, to meet some weavers, and to a museum where we saw some interesting artifacts. 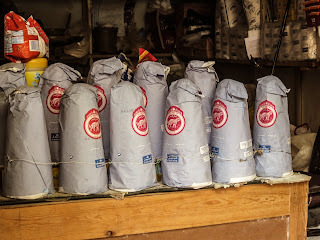 He then took us to a series of shops where we got most of our souvenirs from Morocco. Having Red with us who was from Morocco and who spoke Arabic, made a lot of the transactions go more smoothly than when we had tried to bargain for things on our own. We bought a plate from a an artist who specialized in silver damascene which is special to Meknes. 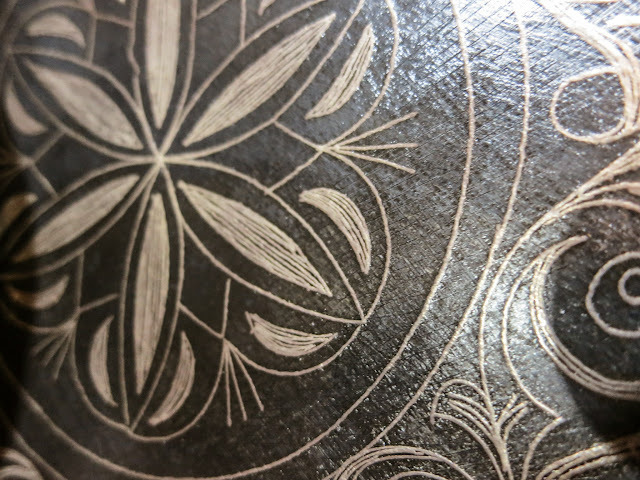 It involves scratching steel and then embedding fine strands of silver into it to make patterns. Red also helped us get a great deal on our rug. You can see both of these in our Packing list post. 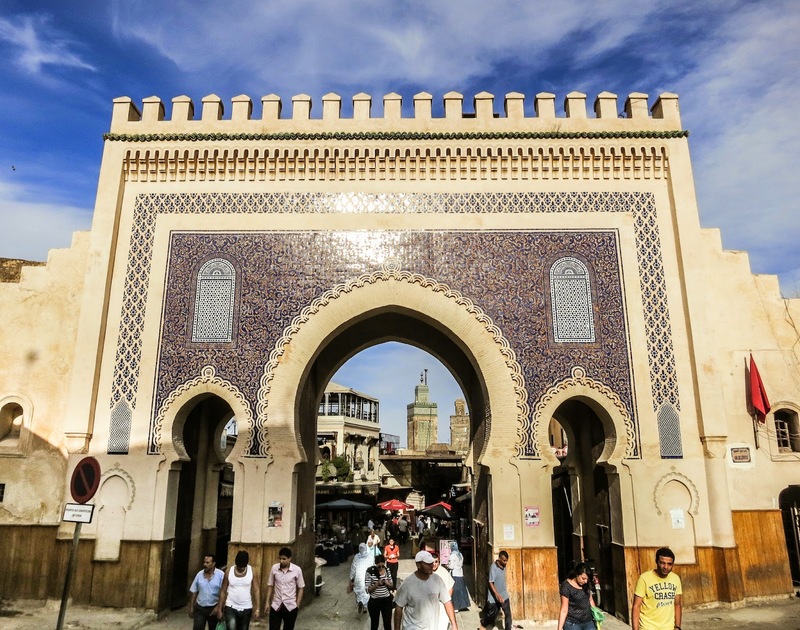 The next day we headed off to Fes. We saw some really interesting things there. We visited the University of Al-Karaouine which was founded in 859 and is in the Guinness book of world records as the oldest running university in the world! 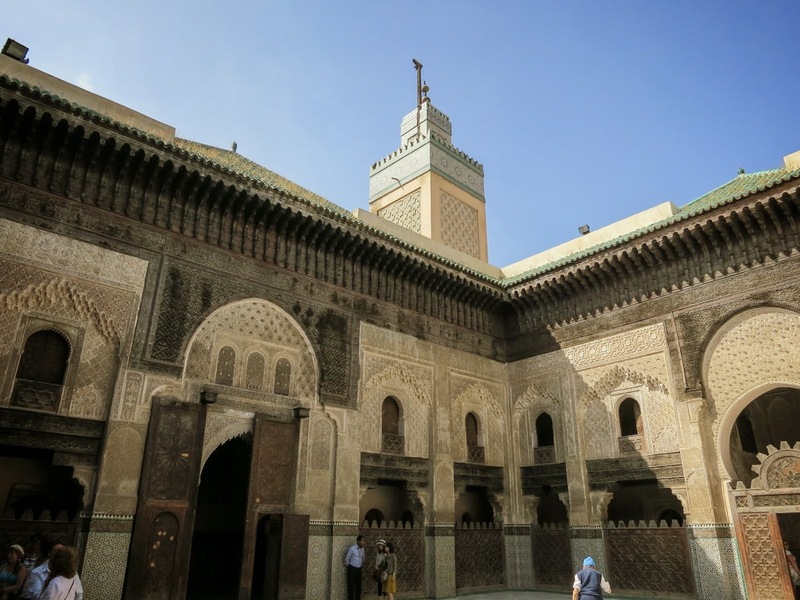 It had the most intricate and beautiful stone and wood carved details in the courtyard we were in. Just outside of the school was the ancient water clock known as Dar al Magana. Which was built in the 1300s and had a complicated mechanism of using water and weights to keep track of the time. It was dismantled at some point, and there are efforts to restore it, but it is not an easy task. We found a young man who offered to take us around the city and show us some sites. He was very good and told us some history, but had to go somewhere and so passed us on to his friend who wasn't nearly as good and just walked us around without saying much, and tried to take us to shops which we had told him we weren't interested in. 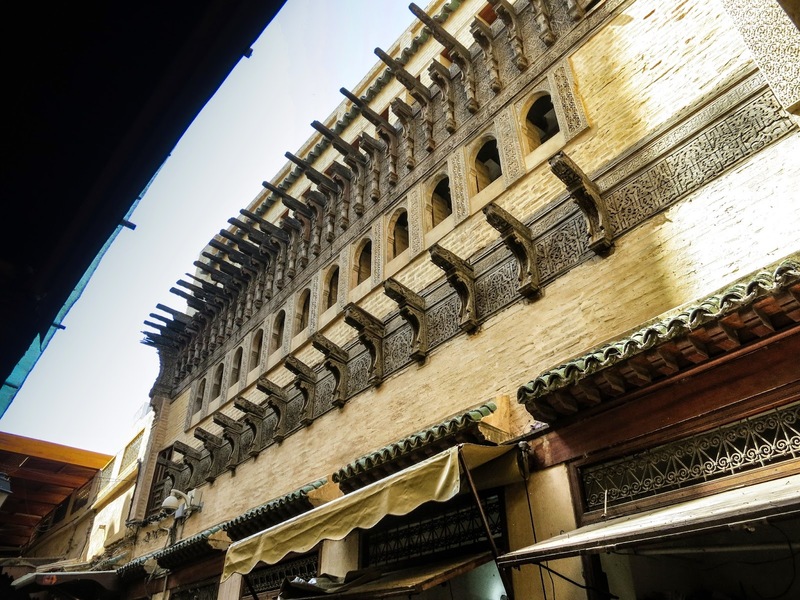 Out final stop was tea at a little cafe with a view of the blue gate or the Bab Bou Jeloud which is another beautiful example of the craftsmanship and architecture of the area.